There is a pervading sentiment in football that Red Bull is a force for bad. Their involvement, from Salzburg and New York to Brazil and Leipzig, is often talked about with a sense of negativity by many the world over. It’s understandable too. In the contemporary game, fans feel isolated and ostracised by the tidal change of ownership, sponsorship and overall modernisation. Red Bull, contrary to popular belief and what is portrayed on the outside, are bucking these trends. If there was a check-list of what constitutes a problematic football team, the Red Bull franchise are emblematic of ticking all of these boxes. The reality, however, is vastly different to the initial perception. Their move into the Austrian top-flight, in Red Bull owner Dietrich Mateschitz’s homeland, was met with instant disproval. Fans of the original Austria Salzburg, of whom Red Bull acquired their license in 2005, were quick to form another club who were in colour, badge and essence, much closer to their original. It wasn’t a good start and it’s where much of this sentiment originates from. In New York it came a little easier the following year. After all, Major League Soccer doesn’t have the heritage or history of the Old Continent. It was when the energy drinks brand tried to muscle into German football, though, that they quickly became public enemy number one. Using legal and technical trickery to circumvent ownership laws, the brand found their space alongside the aforementioned duo and another outfit in Brazil. They were seen to epitomise the descent of football clubs into out and out business and, over a decade on, still carry the same baggage. RB Leipzig’s rapid ascent to the Bundesliga and their second-placed finish in their maiden season under Ralph Hasenhütt – a gargantuan leap from the previous season’s runners-up place in the 2. Bundesliga – is a story trumped perhaps only by Leicester’s Premier League glory in recent years. Red Bull’s across-the-board success, unsurprisingly, didn’t gain them many fans beyond the direct vicinity of the clubs bases, which themselves have been split. It’s odd. Red Bull, in the main, reject big-money, quick-fix transfers, skyrocketing ticket prices, spending a lot of time and money in youth development. They also play nice and exciting football, something necessary across the organisation. It’s groundbreaking, make no mistake, if a little identikit. Despite that, I’d hasten to say that the emphasis on developing a unified internal culture has actually made them the antithesis of the charges waged against them. The Against Modern Football movement, as either a unified entity or idea, has largely run its course. It’s spirit, however, lives on in a more nuanced and arguably more effective way than it did under that banner. Publications, online and in print, are now more critical of football’s rapid shift from a place where community and sustainability were champion towards teams becoming playgrounds and status symbols for the elite. Where billionaires were once happy with a Rolls, they now want a Rovers. We usually don’t like this happening to our clubs. The scorn Red Bull have received from their inception to the present day is partly based on valid concerns, and partly to do with misconceptions pertaining to their brash branding and aggressive tactics representing a summation of football fans’ unarticulated ire. 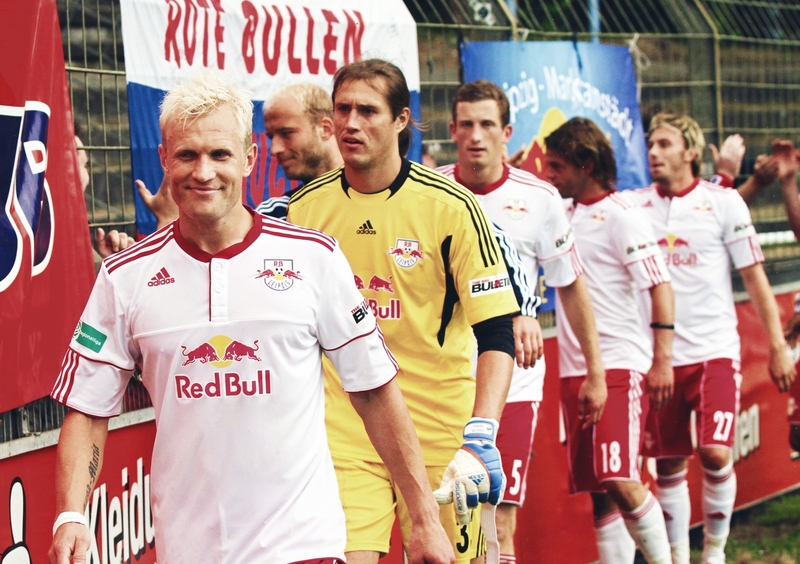 Life for RB Leipzig, the club that has gained the most public attention, began back in 2009. Looking for a host club to begin their crusade through the German leagues, they struck gold with SSV Markranstädt from the eponymous sleepy town of 15,000 inhabitants. Crucially for the growth of the club, it’s situation 10km to the west of Leipzig gave them access to a considerably larger city with over half a million people and, for Red Bull’s rapid ascension, a city that lacked a successful football team. After Germany’s 1990 reunification, the once mighty VfB Leipzig slipped from Cup Winners’ Cup finalists in 1987 to stagnation and eventual bankruptcy in the country’s regional divisions – all in less than a decade. Leipzig, the former home of the German Football Association, was a city crying out for something to rally behind. By both chance and design, they would get it. Acquiring the fifth-tier team was a process that very few, even the local population, could get behind, though. Red Bull’s move into football was viewed with whispered suspicion. Germany can proudly boast having one of the most democratic and fan-friendly football leagues in the world and this multinational brand becoming part of it seemed like a populist propaganda wing for their energy drink. An elaborate marketing stunt, of sorts. Acquiring the club meant creating a vision. This vision was to build a sustainable squad that would play Champions League football – no big ask, then. Dietrich Mateschitz was clear on these goals. With the Leipzig deal set to materialise, they already had a home to move into. The 43,000-seater Zentralstadion was built for the 2006 World Cup and needed full-time occupants. The city’s difficulties in the economic recession played into Red Bull’s favour – they got their license ready in time for the 2009/10 season. Coming to loggerheads with the Bundesliga’s laws on branding, the club couldn’t be as brash with their naming as in New York and Salzburg. The ‘RB’ in their name stands for RasenBallsport, which translates literally to Lawn Ball Sports. It is commonly abbreviated to just RB Leipzig. It’s things like this that have managed to get under the footballing population’s skin, especially in Germany. The laws aren’t broken, but the sentiments behind them are. Historically being not-for-profit organisations, football clubs in Germany were members’ associations until the rule was implemented in 1998, allowing the league some scope for expansion. It has helped keep ticket prices low and debts manageable, creating a more stable business environment for clubs to operate. It was this rule that most defiantly stood in Red Bull’s way. Needless to say, they came up with a crafty solution. 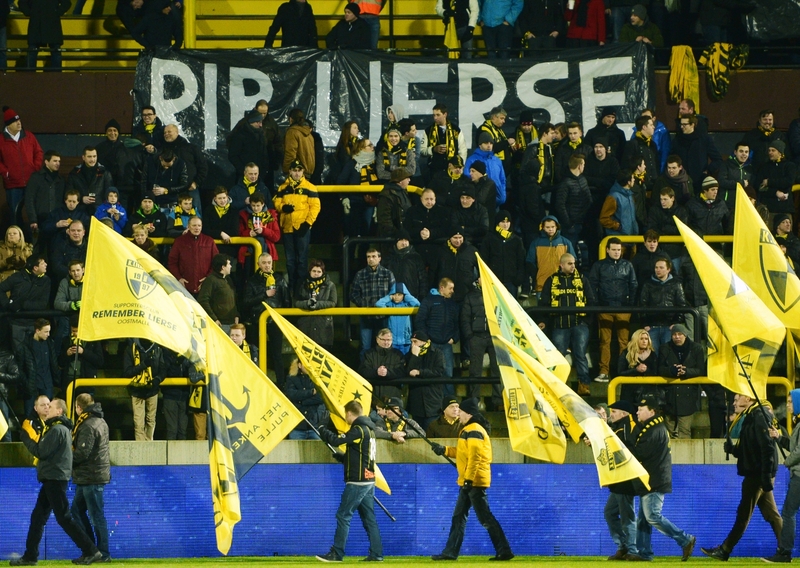 Borussia Dortmund have around 140,000 voting members, paying an annual fee of €62. This makes it exceedingly difficult to implement changes like ticket prices. On the other hand, Leipzig have only 17 members with voting rights, most of which are associated with or employed by Red Bull. They charge a joining fee of €100 with membership costing between €800 to €1,000, depending on the level chosen. None of these bring voting rights. The rule was not legally broken and the clubs had its necessary members to move on. Fans worry that Red Bull have paved the way for new investors to do the same. It looked like Red Bull didn’t value their fans, and protests were carried out in response. Notably, Union Berlin fans, all clad in black, spent the first 15 minutes of a tie in 2014 ominously silent, highlighting the importance of their presence. 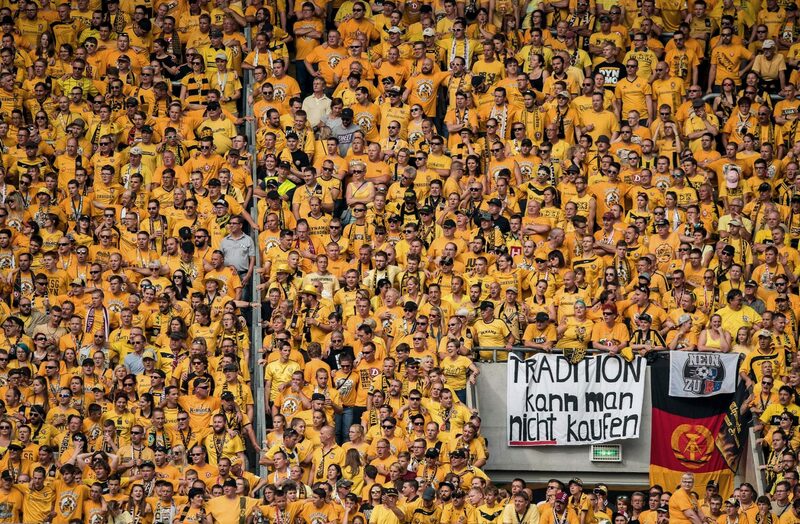 Dynamo Dresden fans responded by throwing a severed bull’s head onto the field, and both made the headlines. Their acquisition of Austria Salzburg was even less tactful, but received far less coverage in global media. When Red Bull came to the club, Austria Salzburg wore violet. 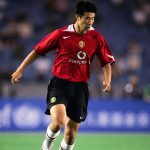 The brand was quick to remove all traces of that colour and refused to acknowledge any of the club’s history before 2005. Fans, understandably, felt alienated and angry. Lacking the organisational structure of German football, they created a new team, relinquishing an opportunity to start something from the bottom that was untarnished by the overt commercialization Red Bull had brought. Moreso than their entry into German football, this felt like a hostile takeover. Red Bull’s offer of retaining the violet for the goalkeeper’s socks at away games only read like an insult to the fans. Despite heavy resistance, Red Bull’s meteoric rise in football is something of a modern fairytale, yet most fans view it as a nightmare coming true. The Austrian brand doesn’t seem to care, however, quietly revolutionising the game and making a mark no business has ever been able to achieve at club level. Football clubs in East Germany have been far less successful in the unified era. 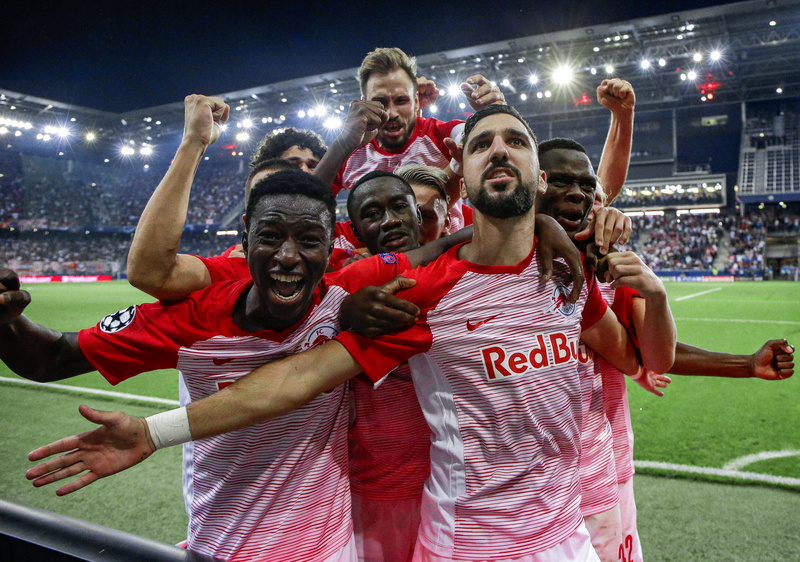 Clubs in the economically more powerful west dominated in the years following, and the rapid rise of RB Leipzig has been interpreted as a side buying success, an opinion shared by fans in east, west and beyond. Upon entering the Bundesliga, eastern Germany finally had a figurehead of success, only the traditionally more socialist part of the country was unable to reconcile the Red Bull model with the one they’d hoped to export. Incidentally, the ethos and attitude of Red Bull is a lot closer to the spirit that those in the east hold dear than may first appear. For such a vast section of the country, east Germans are vastly underrepresented in the Germany squad. One of Red Bull’s most critical moves is in their investment in academy level football and dedication to working within a structural framework aimed at creating a unified vision of success. The initial interference of Red Bull’s businessmen hampered their success as a football club, but this all changed with one man. Red Bull have a super-computer, which isn’t a machine, but rather a man who functions like one. Ralf Rangnick took over as sporting director at Red Bull for both the Leipzig and Salzburg clubs in 2012. He quickly saw the need to implement a template for each to roughly work from. If there’s one goal, it’s easier to find ways of achieving it. This vision is summarised by Rangnick, the brains of Red Bull’s football venture, as the three Ks: ‘Kapital, Konzept and Kompetenz.’ Known as the “Professor”, after his history in academia, Rangnick has developed these principles as a means of creating consistency within the franchise. He’s now the benchmark for what a sporting director should be at various organisations that own more than a single club. Never one to downplay their financial backing, he rather takes it as par for the course and focuses on his task: creating a successful and self-sustainable club. RB Leipzig have spent money, but have done so wisely, signing players like Timo Werner in 2016 for €14m, the club’s most expensive transfer at the time, yet a player who has continually impressed in his two and a half seasons at the club. Similarly, bringing in Hungarian centre-back Willi Orban from Kaiserslautern for a mere €2m was a masterstroke. Orban was instrumental in their promotion in 2015/16 season and has since been named club captain. In 2013, in-demand Danish forward Yussuf Poulsen joined for €1.3m in time for the club’s maiden year in the third division. Only 19 at the time, he netted 10 goals in 27 appearances and has played almost continually since. This season he’s rivalled his previous year’s goal tally in 23 fewer games. It’s clearly not the money that attracts these young players to the Red Bull project – RB Leipzig spent less on wages than teams like Bayer Leverkusen, Schalke and Wolfsburg in 2017/18 – but their emphasis on development. Rangnick has made his intentions clear: he aspires to have “every young talent in the east to run through our professional academy”, thereby adding some balance to the inconsistent state of grassroots football in the region. It’s not just the academy facilities themselves, although the state-of-the-art complexes are a big draw – it’s also this internal structure, Rangnick’s three Ks, that helps to nurture talent and exists at all of Red Bull’s clubs. A prime example of this is Naby Keïta. Salzburg signed the 19-year-old Guinean from French minnows FC Istres for €1.5m. Their scouts are good and have very rarely missed the mark. In his second season at the Austrian outfit he won the Bundesliga’s Player of the Year before moving on to RB Leipzig for a further two years, helping the newly-promoted club to a second-place finish and earning himself a spot in the league’s team of the season. He spent one more season at the club before heading to Liverpool for €60m. Similarly, Sadio Mané signed for Red Bull Salzburg for around €4m before moving to the Premier League only two seasons later for more than three times that value. The clubs have money, but they also generate it. Their signing expenditures pale in comparison to clubs playing at their level. The accent is put on buying low, developing and selling high. When Salzburg met Celtic in this year’s Europe League, the Austrian’s walked away with a 3-1 victory. In that side were two players from their youth academy and feeder team FC Liefering in Hannes Wolf and Xaver Schlager, whilst the others were similarly young and just cheap. The only player in the side that cost more than a million euros was Israeli striker Moanes Dabour. On the other hand, Celtic’s sole goalscorer, Odsonne Edouard, set the team back £9m. He was more expensive than the whole Salzburg starting line-up combined. 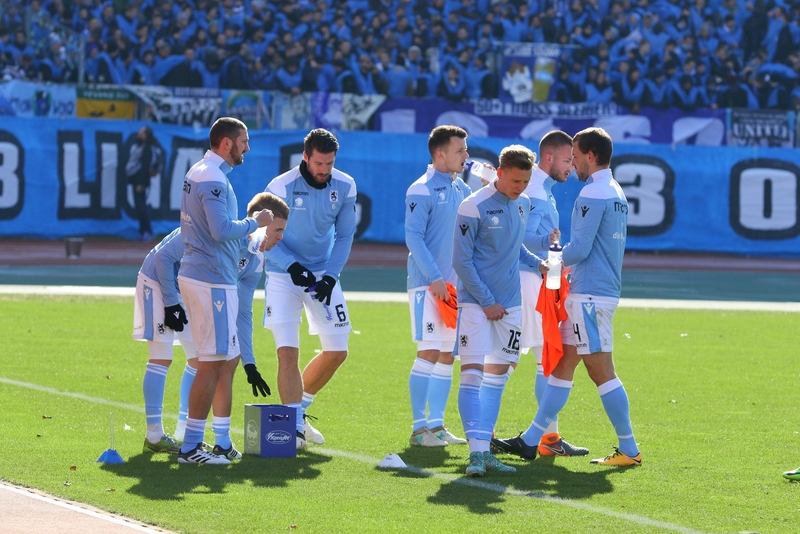 Indeed, The Guardian’s Philip Oltermann wrote in 2016: “Under their innovative director of sports, Ralf Rangnick, RB have played attractive football and invested mainly in young players no older than 24.” The club have been hugely successful since the takeover, winning the Austrian Bundesliga nine times. Rangnick has since gone on to manage RB Leipzig and, at the end of this season, will be replaced by Hoffenheim’s 31-year-old Julian Nagelsmann. This allows Rangnick to return to his position as sporting director. It’s this role, focusing on every aspect of the organisation’s management, which suits him best. Although focussed on the two European entities, his impact has reached both the New York Red Bulls and their Brazilian sister-club. The club’s vision is compelling and goes beyond just the players. The procurement and development of staff is also crucial in making the whole thing work. Former Red Bulls coach Jesse Marsch is now assistant at RB Leipzig and his former assistant in New York, Chris Armas, has stepped up to take the hot-seat. These moves seem preferential to the club, rather than drafting in big-name managers, uninitiated in their unique culture and perhaps unwilling to adapt. Spielverlagerung consists of deep analysis of formations, tactics and managerial/coaching styles. It’s a place where ideas are left out in the open. Above all it showed Marić’s deep knowledge and passion for the game. It illustrated his willingness to constantly develop and learn. Acknowledged by Thomas Tuchel while at Mainz, Marić shined working on clandestine missions and eventually caught the attention of Rose at Salzburg’s under-18s. Marić asked if the German needed an assistant and Rose took the chance on the football-obsessed kid. He’s stuck by him since and Marić is now his assistant at the club. Red Bull’s willingness to take the gamble on such a relatively inexperienced appointment, at least in the classical sense of coaching, speaks volumes about their radical approach to the game. What these operational decisions manifest as, in all of the Red Bull teams, is a high-energy, high-pressing side that is dynamic and exciting to watch. At the beginning of this Major League Soccer season, the New York Red Bull’s had a fixture against Portland Timbers; faced with a CONCACAF Champions League match against Tijuana, then-manager Marsch decided to rest most of his starting line-up. The result was an opportunity for academy players to show their worth. The Red Bulls routed the Timbers 4-0. With franchises signing players from outside of the country with increasing regularity, this was a refreshing sight. Having sold graduate Matt Miazga to Chelsea and watching he and Tyler Adams break into the US national team is a testament to the system’s efficiency. That a team made almost entirely of homegrown talent was able to so deftly dismantle the formidable Timbers showed how well the players and club can synchronise their ideas and movements. The American side were initially inclined to make big-name signings that, for a while and in some sense, were effective. It essentially flew in the face of their values, though. They couldn’t develop their own signature unless things grew more organically. Germany’s vastly depleted footballing landscape in the east is now a fertile ground for development, while in the US, the continued growth of Major League Soccer is increasing the demand for fresh, homegrown talent, of which the New York side strive to supply, thanks in part to the largest community coaching programme in the tri-state area. One regular complaint in the modern game is that egos are allowed to dominate. This goes for managers as much as players, often forgetting that egos have long since been a part of football. Internal tension, however, can destroy otherwise strong sides. Red Bull’s system aims to create unity in every area, focusing on a player’s ability to integrate above most else. Under the watchful eye of Rangnick, Red Bull have developed a system where individuality has been as good as stripped. It might sound totalitarian, but when implemented this way, it equates to humility. It allows everyone involved to go in and do their job as best as they can. The Red Bull teams focus on high-pressing football. If the ball is lost, the opposition will find themselves swarmed. In attack, the squad think like a pack, executing smart runs and opening up spaces to advance. In transition, they’re sharp. Think of it as a Red Bull blueprint. Fellow coaches, players, pundits and online commentators view it as progressive football, which is particularly impressive in the Bundesliga, a place where innovation and tactical progress permeates throughout most clubs. No matter the coach or the players – the system maintains continuity. With Nagelsmann joining RB Leipzig in the summer, the Germans can look forward to taking the next step. It will be the Bundesliga’s youngest club with its youngest manager. Nagelsmann brings more than just age, though. The prodigy is known for his man-management and veneration of fluid football, two facets that should help him hit the ground running. His possession-based approach is less vertical than Rangnick, a preacher of pressing, and is more patient than RB Leipzig are used to. It’s difficult to say how much of his own style he will bring but it is certain the partnership is long-term. When Nagelsmann first arrived at Hoffenheim as the under-17’s assistant, Rangnick was the boss. The two have publicly complimented each other’s style, with Nagelsmann often being referred to as a disciple of Rangnick’s method of play. Such shifts in personnel aren’t to be taken lightly. It’s not just a change in tactics for Red Bull, rather a reshaping of identity. Before moving over to Germany as Rangnick’s number two, Marsch had worked closely with him whilst in New York and was able to unify the European style and adapt it with the necessary American flavour. Of his relationship with the players, he was clear: “The more the players take ownership of the team and make it theirs, the better we are.” This is a team with no place for egos. Watching them play, or monitoring their player’s social media accounts, only verifies the efficiency of this strategy. The players are relatable. Their style of play is exciting. The approach is humbler than they’re giving credit for, with far too much focus on their acquisition of clubs and not what happens after. Beyond being easy on the eye, RB Leipzig are also easy on the pocket. Nestled in-between Augsburg and Fortuna Düsseldorf, their season tickets begin at €180, less than their fiercest critics in Dortmund (€215), Dresden (€195) and Union Berlin (€187) – the latter two being in the 2. Bundesliga. So why all the hate? German legend Michael Ballack praised the club to Sport Bild: “The conditions in Leipzig are already ripe for the Champions League, I didn’t think it would happen so fast,” before going on to elaborate on the protests the club faces: “I think that is a debate caused by envy.” For all the cries of a machine that lacks identity, their short history in football is best defined as a quest to find one. The criticism doesn’t stack up. That doesn’t mean the criticism is unjust, though, nor is it limited only to the franchise’s methods of gaining entry to the leagues, although the stigma from then will take a long time to shed. A very public affair, it jarred with Germany’s proud heritage of a league largely devoid of commercial entities, despite the fact that Bayer Leverkusen, Wolfsburg and Schalke, amongst others, have enjoyed considerable financial backing from major international corporations. For many, Red Bull’s entry undermined the structure that keeps the league so democratic and fan-orientated. Their pathway into Austria was even more brutal. RB Leipzig’s manipulation of the 50+1 rule isn’t pretty, but business doesn’t tend to be. After the east of the nation was hit particularly hard by the bombs of World War Two, they hardly had time to recuperate under the Soviet regime. The west of the country, on the other hand, enjoyed the Wirtschaftswunder (economic miracle), which details the rapid reconstruction and redevelopment of the West German and Austrian economies. The rapid rate at which private capital was sunk into cities like Dortmund allowed great prosperity, and naturally, the football clubs benefitted from it too. When clubs in the west utilise their financial might, barely an eyebrow is raised. It seems that memories can be short. The east’s struggles are clear to see in the make-up of the Bundesliga, with RB Leipzig being their sole representative. Their entry in 2016 was the first for any club from the east since 2009 and only one of five since reunification. Progress often comes at a cost. Red Bull’s evolution in football, just like in Formula 1 and their various other sporting ventures, has been nothing short of revolutionary. There are no superstars unless they make them. There are no egos to check or exorbitant transfer fees to justify. It stands to reason that the Red Bull model will eventually be emulated and embraced, rather than derided, in the footballing community. Their willingness to take calculated risks when innovating both strategically on the pitch as well as structurally behind the scenes has laid a healthy groundwork for teams wishing to become more stable in an environment that’s constantly in flux. However, it doesn’t change the fact that they’re an easy target. You just have to look at their kit. Perhaps that’s the main problem. People have only looked at the large, red, garish bulls and drew the line there. But these things run much deeper, and for every Gazprom-financed giant or Bayer-sponsored club, there is a Red Bull team aiming to stick to a blueprint, if through means that have been unconventional. Red Bull have shaken up the German footballing economy and are on course to challenge Bayern Munich’s dominance in the future, something fans have longed for. In the US, the Red Bulls are helping to provide Major League Soccer with a genuine alternative to big names approaching their final days. Between the three sides, their energetic and innovative football is gaining plaudits by the match. 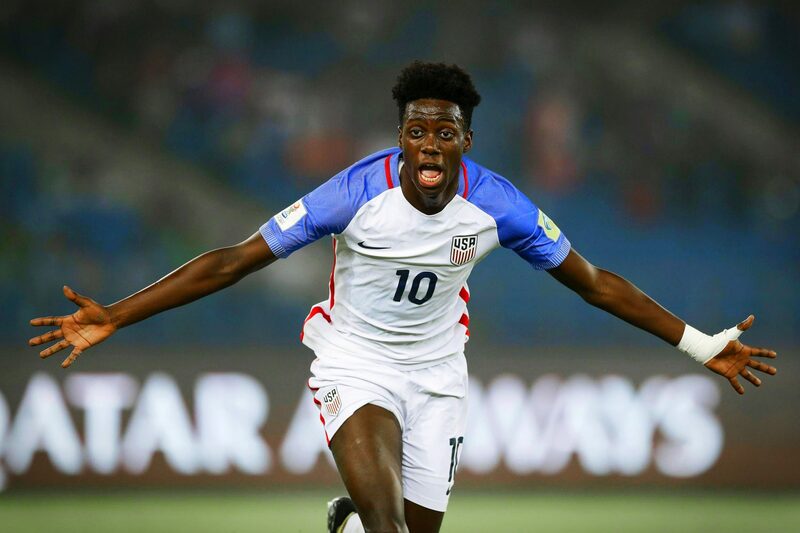 Above and beyond all of the politics and shady business deals, that is a reason for us to praise their project above all else: young players are being promoted to play some of the most intense football around. The clubs are finding stability that will in no doubt continue to grow – stability that other billionaire-owned clubs are failing to achieve. If we are able to look past how they arrived into the world of football and what they’ve done since, the perspective on Red Bull in football takes on a different shade. Indeed, Red Bull, it seems, gives you wins.